How Vistara is chasing a small market with big ambitions. Soon, it will go away. Every rupee counts," says Phee Teik Yeoh, CEO, of the newly-launched carrier Vistara, pointing a finger to the light panel attached to the ceiling. Yeoh, who along with his team of over 100 people shifted to a new office in Gurgaon on March 2, was referring to one of the ways in which he can cut costs. For any domestic airline, nearly 70 per cent of the costs are fixed, which includes aviation turbine fuel (ATF) expenses, landing and parking charges, and leasing cost. It has to manage the remaining 30 per cent well to stay profitable. But it is not just better cost management that will decide the long-term future of Vistara, a full-service carrier, in the Indian aviation market. Vistara is the third full-service carrier in India. It plans to offer a superior product, including a premium economy class - an emerging segment globally. It can succeed if it manages to scale up fast while continuing to command premium over its competition. Its journey will be fraught with challenges on both operational and cost sides, and cracking the full-service model will not be easy in a market like India where airlines come to die. 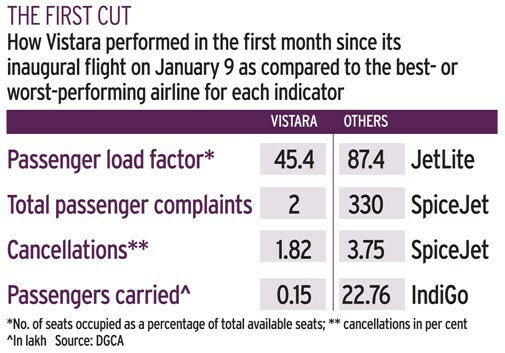 So what lies ahead for Vistara? If it has to succeed, it will have to find a way to differentiate itself in what is becoming a commoditised market; it will have to keep costs in control in an industry where operational costs spiral out of control; and flying abroad could be a game changer as and when it happens. For Yeoh, there are multiple challenges. The biggest issue is the size of the business class market it is chasing. According to research and advisory firm Centre for Asia Pacific Aviation (CAPA) India, local low-cost carriers (LCCs) had over 60 per cent share, in terms of seat capacity, in January. Business class seats are just 3.5 to four per cent of total domestic seats. In India, the size of the business class market has been small due to the huge gap between the economy and business class fares - roughly three to five times. Globally, it is one-and-a-half to three times. Yeoh says one can choose to perpetuate on historical statistics or do something to create demand. "Ever wondered why the proportion of business traffic is so low? Many business travellers are forced to travel in economy [class] because there is a lack of choice and offerings. 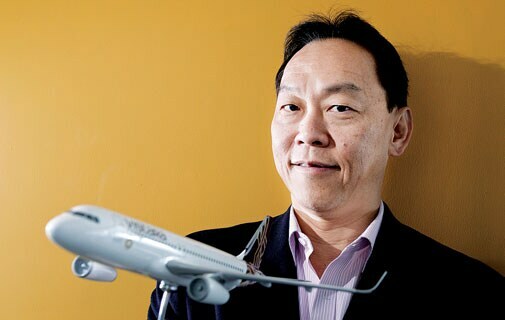 The aviation market is at the cusp of change," he says. The business class demand is cyclical. It is directly linked to economic conditions as more than 60 per cent of the aviation demand is estimated to be generated by the corporate sector whose annual travel budgets are linked to business sentiment. People in India do not usually travel by business class for leisure. Many companies had cut down on air travel and enhanced their video-conferencing facilities after the 2008 economic slowdown. The CEOs then were setting a personal example of austerity by travelling economy class. But with the situation improving, more companies are willing to loosen their purse strings. Vistara hopes the business class will grow if the economy expands. But there's always a downside, to which Chief Commercial Officer Giam Ming Toh says, "Every business works on certain assumptions. If some parts of those assumptions do not materialise, we have to make adjustments." Toh says a significant majority of the airline's traffic will be business- oriented. "Not just big companies, but also people who run their own businesses. As companies get bigger, they will have more executive level staff to fly business class." To be successful, Vistara needs to have a cost base that is closer to LCCs, and a premium front-end. The steps to keep its cost base low were taken early on. When the two parents - Tata Sons and Singapore Airlines (SIA) - signed a pact in September 2013, a business plan was made. Some of the things were decided in the plan - for instance, to make Delhi a hub because it has low ATF prices and a less congested airport compared to other metros. In Delhi, a kilolitre of ATF costs Rs 50,363 versus Rs 51,704 in Mumbai, Rs 59,479 in Kolkata and Rs 55,346 in Chennai. Also, the Vistara management knew that airport charges will be reviewed after 2014 and expected new charges to be lower. In February, the Airports Economic Regulatory Authority (AERA) proposed a 78.4 per cent cut in airport charges for Delhi. Fuel costs account for 45-50 per cent of an airline's cost whereas airport cost is less than 10 per cent. Then, at the planning stage, a huge emphasis was given on costs and reducing the time to get things ready. For instance, one of the first things it did was to send out a request for proposal documents for aircraft because manufacturers take some time after the orders are placed. It went to both Boeing and Airbus. The India market is predominantly A320s and 737s. While Jet Airways and SpiceJet use 737s, the other major carriers fly A320s. Airbus met its requirements, including finding a leasing company - BOC Aviation, a Bank of China subsidiary - that gave a package of 20 aircraft spaced over three to four years delivery schedule. "Airbus met our requirements better and they were also competitive in pricing," says Toh. Also, the airline decided to go for simple leasing instead of the sale-and-lease-back model, which many domestic carriers follow. The airline is controlling other non-customer facing expenses as well, including outsourcing services such as airport handling, IT, engineering maintenance and line maintenance. Most airlines outsource only heavy maintenance whereas line maintenance covers daily checks and handling of spare parts. "It saves capital and minimise cost," says Kapil Kaul, CEO (South Asia), CAPA. So far, it has kept the manpower lean. With total staff strength of over 400 and five planes, the plane-to-employee ratio is about 80, which is lower than the ideal ratio of 90. "We also leveraged on Singapore Airlines' expertise to get competitive contracts in areas of engineering maintenance and aircraft leasing," says Yeoh. Unlike its competitors, Vistara's office has a look and feel of a start-up. Nobody in the senior management - not even Yeoh - has a cubicle or cabin. Interestingly, the airline started out from Vivanta (a Taj Hotels brand) in Gurgaon, and has shifted twice in 15 months to accommodate its growing workforce. Vistara aims to command premium on its differentiated product offering. In fact, it claims to have pioneered a new concept in Indian aviation by introducing the "premium economy" class. The idea is to cater to people who cannot afford business class - or even people who can afford business class but find it too expensive - but also do not enjoy economy class services. Several attempts have been made in the past by various carriers to address the growing demand of premium economy. In 2010, Jet Airways, through its low-cost brand Jet Konnect, had introduced semi-business class on select routes. Last year, Air India converted its first two rows of the all-economy A320 aircraft operating on Delhi-Guwahati-Imphal into a premium economy class. The middle seats between aisle and window in these two rows are not sold. Later, SpiceJet also came out with 30 premium economy seats in the first five rows of its Boeing 737. Vistara says it is the only airline to offer exclusivity to premium economy passenger by having a separate cabin. Other airlines don't have special cabins. "Our premium economy is not just about two more inches of legroom," says Toh. A Delhi-to-Mumbai cheapest economy ticket on Vistara for May 1 costs Rs 4,558 (as on March 18), and the lowest business class ticket costs Rs 23,422. So, Vistara offers premium economy starting at Rs 6,867 which, when compared to economy class, offers three to six inches more legroom and 5 kg more baggage. Also, there's separate check-in, priority tagging of bags, segmented handling of customer calls, separate boarding queues and more menu options. Rahul Prithiani, Director (Industry Research) at CRISIL Research, says premium economy is a popular category globally. However, the success of this segment is not known in India yet. Globally, premium economy has done well for several carriers, including Cathay Pacific and Air France, which cater to business travellers who might downgrade to economy if they are facing budget constraints or are not willing to pay a higher price. Air France, for example, aims to modify and install over 1,100 premium economy seats on its 44 long-haul aircraft between June 2014 and July 2016. In fact, SIA is planning to introduce premium economy class to some of its fleet. Vistara says its configuration of 148 seats for an A320 is lower compared to IndiGo's and GoAir's 180 seats. Its seat configuration is business class (16), premium economy (36), and economy seats (96). The airline's seat factor stood at 45.4 per cent in January (the month it started operations) but it hopes this number will go up in coming months. The key differentiator for Vistara's business class is more legroom. It offers 42-inch seat pitch, highest among full-service carriers on local routes. Jet Airways' business class (PremiÃ¨re) and Air India's domesticAirbus A321s have 40-inch seat pitch. Seat pitch refers to the distance between the back of a seat and the back of the seat in front. Vistara feels for a flight of about two hours on A320s, there's little scope to offer vastly different services, and so, the focus is on end-to-end passenger experience. "For a new airline, scaling up the network is crucial as customers want multiple options"
For a business traveller, the key thing is timeliness. They give superiority to punctuality over experience. Toh says the airline is aiming to achieve higher on-time performance (OTP) through combined efforts of its crew and third-party agencies (for ground handling). The boarding for each class - business, premium economy, economy - is designated, which results in quick processing. It also does automated check-ins through which passengers get boarding passes on email four hours before departure. It is believed that product differentiation does not make airlines profitable because there is intense competition. "For a new airline, scaling up the network is crucial as customers want multiple options. 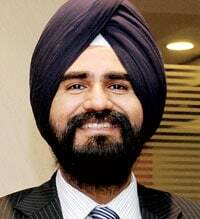 If you are unable to give enough choices, you are not a preferable carrier," says Kuljit Singh, Partner at consultancy EY. In India, network planning is not easy. 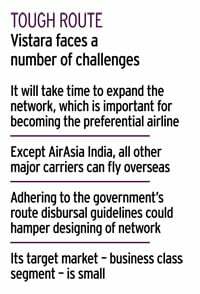 Under the government's route dispersal guidelines, all carriers must deploy some part of their capacity to remote destinations that may not be financially viable. Vistara has a weekly frequency of 164 flights. Experts say that route selection has to be based on demand analysis. Flying 16 business class seats with barely four seats occupied would hurt the airline. With Vistara, the business class is making a comeback in the Indian aviation market. Prior to 2003, the domestic aviation market was largely driven by three full-service carriers - Indian Airlines, Jet Airways and Air Sahara. In 2003, the entry of Air Deccan shifted the focus to LCCs and in the next few years, the market was dominated by LCCs, primarily IndiGo, GoAir and SpiceJet. Of late, there's a shift towards business class. 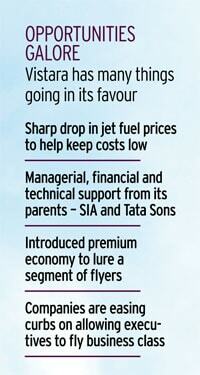 For instance, Jet Airways has decided to focus on the full-service model since last year. The shift has worked for Jet, as demonstrated by its impressive occupancy and market share over the past few months. Jet recorded passenger load factor (PLF) of 83.8 per cent, 89 per cent and 87 per cent for November, December and January, respectively. Its market share has risen from 8.17 per cent in July 2014 to 12.25 per cent in January this year. Air India is also reporting high domestic PLF in recent months. Although Vistara management might not admit but it will complement the services of its parent SIA once it is allowed to fly overseas. Its model can work much better on international routes for two reasons. First, business class or premium economy travel is preferred by executives on longer-duration flights. On metro routes, with high share of senior corporate travellers, there will always be a section that can afford business class travel. On international routes, most MNCs and large domestic companies allow senior as well as mid-level executives to travel business class if the flight duration is above five hours. Also, facilities such as more legroom and in-flight entertainment, which Vistara plans to launch soon, has more takers on long-haul flights. Rajesh Magow, Co-founder and CEO (India) of Makemytrip.com, says premium economy and business class would do well in long-haul flights. Second, Vistara will be able to fly to the West, which SIA has not been able to do due to regulations. For instance, if SIA has to fly passengers to London from New Delhi, it will have to first take them to Singapore from Delhi before heading to London. Vistara can directly fly these passengers to London. This is why Emirates, based in Dubai, has been able to cater to business class travellers from India visiting Europe and the US. "We can't assume rules will change. There's nothing stopping us from competing with SIA. We are an Indian carrier, so we could use rights from the India side and compete," says Toh. Under the current norms, an airline needs an operational experience of five years and a fleet of minimum 20 planes before it can fly overseas. Meanwhile, the airline is mum on its expected timeline to break even. "In the business plan, we have a timeline to get to profitability but it's a moving target," says Toh. Industry experts say profitability is not a big issue at the moment. But there's a possibility of conflict emerging between Vistara and low-cost carrier AirAsia India, a Tata joint venture with Malaysian carrier AirAsia, in future. "Though both cater to different segments and theoretically can co-exist, but practically I see this as a strategic conflict that will need to be sorted out," says CAPA's Kaul. Yeoh dissipates the possibility of any such conflict. "The market is big enough. We are in two different segments. Even in the economy class, the market is big and there's a different profile of economy class passengers [in the country]," he says. In the price-conscious Indian aviation market known for more failures than successes, Vistara is surely making a bold attempt.